My hunt for high-quality formulations is getting a little easier, because with one scan of an ingredients list, I can easily rule out products that just might not cut it for me anymore. Gone are the days when I’m impressed by uncreative concoctions that are supposed to do it all for my finicky skin. I want skincare that deliver the vitamins, nutrients and antioxidants proven to protect skin from environmental damage — and I think I’ve found a bit of what I want in Marie Veronique’s Serum De Jour. Marie Veronique Serum De Jour is an antioxidant-rich, gel-like serum that combines ferulic acid with vitamins C and E to provide environmental protection and keep skin bright, clear and vibrant. Think of it as a glow in a bottle, with science to back. Vitamins C, E and ferulic acid combined is a known skincare powerhouse, with studies showing that this combination of antioxidants protects the skin from daily oxidative stress and photo-aging. To further prevent stress to the skin, Marie Veronique Serum De Jour can be layered over antioxidant-rich oils or under your favorite non-nano, zinc-based sunscreen. Quite honestly, it’s exactly what I’ve been looking for in a daytime, layering serum. Marie Veronique Serum De Jour’s thin gel consistency makes it easy to blend with your favorite moisturizing facial oil, or apply in thin layers if you prefer. The texture is never sticky, like some true serums can be, and it spreads wonderfully, never gumming up or turning that weird shade of off-white like some traditional serums do when massaged in too quickly. 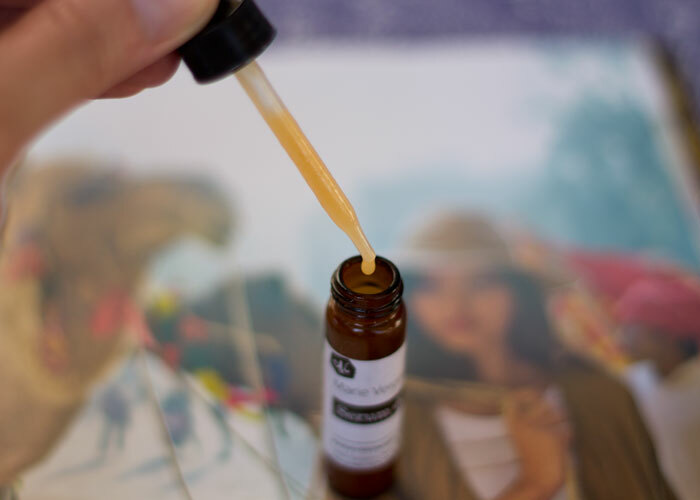 While I’ve found some other lovely hydrating gels to layer with my oils, the combination of vitamins C and E with ferulic make Marie Veronique Serum De Jour stick out to me. Camellia oil is rich in oleic acids and vitamins A, B, D, and E as well as omegas 3, 6 and 9. It’s a fast-absorbing oil that is an ideal match for facial skin. Olive oil contains vitamin E, polyphenols and phytosterols. These major antioxidants aid in protecting the skin from the elements. Olive oil is also rich in moisturizing oleic acid. Neroli and lavender hydrosols keep the formulation from feeling too thick while adding calming and grounding properties to the serum. Helichrysum and lavender essential oils bring natural antiseptic and anti-inflammatory properties to Marie Veronique Serum De Jour, which is fantastic for us who are straddling the line between adult acne and aging issues. 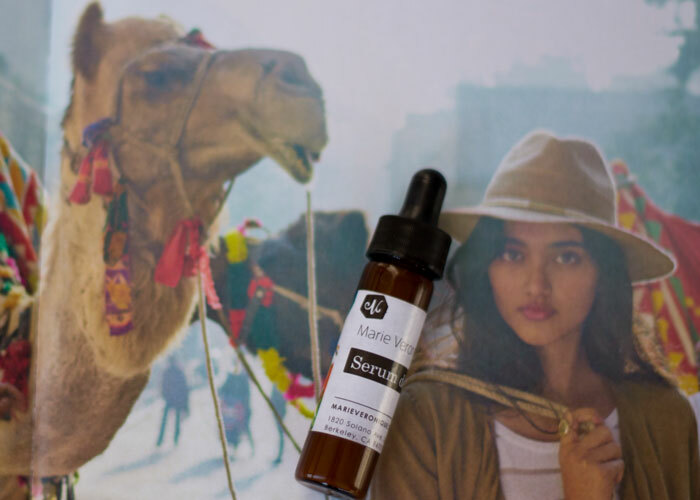 It’s also notable that Marie Veronique Serum De Jour does not contain sodium benzoate, a known skincare irritant that poses some special problems when used in combination with vitamin C.
Founder Marie Veronique, a chemist and aesethetician, drops wisdom like that and more on her thoughtful, smart blog that is all science and no sales, which is refreshing in the ever-growing green beauty space. One reason I’ve become drawn to this line (and some others that have a similar science + nature point of view) is its ability to sell me products based on proven ingredients that work — versus heavy marketing, vanity packaging and overall hype. Both Marie and her daughter, a physicist and bio-medical engineer, work together to formulate standout products with top-notch ingredients that address a variety of skincare concerns. And that’s comforting to know when you’re trusting the health and appearance of your skin to little bottles of green beauty magic. I believe Marie’s products will stand the test of time, and that’s why I want them defending my face on the daily. So in case it isn’t obvious, Marie Veronique Serum De Jour is on my repurchase list, and I’m giddy to share a few more reviews with you from this fantastic line (hint: look for posts on Gentle Retinol Serum and Eye Recovery Serum in the coming months!). What’s your antioxidant cocktail of choice? As you try more green beauty products, what lines stand out most to you? Have you tried anything from Marie Veronique? Tell me in the comments section!